The written word serves visual comedy poorly. So go now and watch performance artist Mr Let’s Paint TV on YouTube. He’s not hard to find. You’ll see a middle-aged man in a suit, jogging on a treadmill. Beside him is an easel and canvass. He introduces himself as John Kilduff, host of Let’s Paint TV. A bluescreen behind him rotates through grainy, miscellaneous backdrops, often featuring close-ups of Kilduff in action. He introduces the agenda for the show. In addition to jogging and painting, this could be blending drinks, shaving, ironing or playing chess. The central theme? Do it all at once. “We really can do it all!” Kilduff pep-talks viewers, beginning to pant with exertion as he slathers paint on the canvass. Kilduff is an artist living and working in Los Angeles. 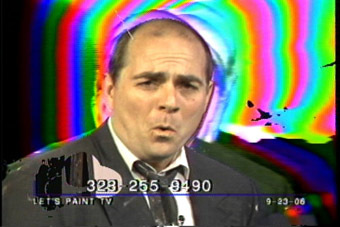 Let’s Paint TV began in 2001 as a public access cable TV show, with Kilduff taking live – and often obscene – calls from viewers. When public studios were shut down last year, the show re-launched as an internet-only phenomenon. Around 10 minutes after it begins, Kilduff is covered in paint and debris – shaving cream, canteloupe juice, burst balloons – from his activities. But depending on what the goal was, he’s probably achieved it, although in the most haphazard, messy and absurd way possible. Does it matter that none of it is any good? Nope, not when your motto is ‘embrace failure’. Embrace Failure is the name of Kilduff’s “world tour”. He’ll be doing four collaborative shows at the Electrofringe festival alongside experimental noise musicians such as Holly Fluxx, Kati Cubby and Toecutter, as well as Japanese “live action painter”, Iko. By all accounts, it’s going to get a little crazy. Musician and video maker Tim Dwyer is organising Kilduff’s Australian dates. He explains that aural and visual overload is all part of the show, channeling the spirit of Let’s Paint TV itself. According to Electrofringe co-director Daniel Green, Kilduff will fit right in. Kilduff says he’s looking forward to the collaboration.